Sales momentum for the Focus RS has been "incredible" in the US. Over the years, Ford has produced some of the most desirable, and downright affordable hot hatches on the market, such as the ferocious Ford Focus RS MK1 and II and Fiesta ST. The catch? They were only sold in Europe. That was until recently, as performance models of the Focus and Fiesta donning the signature ST badge suddenly hit the US market. But then came a bigger surprise: last year, Ford decided to bring the 350-horsepower, all-wheel-drive MKIII Focus RS to the US. The Focus RS has generated so much interest in the US, that buyers aren’t afraid to delve deep into their pockets, either. Average selling prices for the Focus RS were $42,351, which is much higher than the model’s $36,120 base price. The reason? Over 62 percent of buyers opted for the optional RS2 package, which adds additional luxuries such as Recaro leather seats, as well as heated seats, mirrors and steering wheel. Granted, these sales are paltry compared to overall sales of the Focus, but it's encouraging considering that hot hatches don't tend to sell well in the US. Stealth Gray was the most popular color choice for the Focus RS, representing 32 percent of sales. This was closely followed by Nitrous Blue accounting for 30 percent of sales, while 20 percent of buyers opted for Shadow Black. Only 18 percent of customers spec'd out their Focus RS in Frozen White, despite white being a fashionable color for cars in recent years. 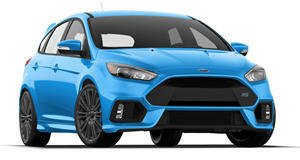 California was by far the most popular consumer base for the Focus RS in the US with 627 units sold, followed by Michigan where 256 were sold, and Texas where 244 were sold. Production of the current Ford Focus will cease in 2018 to make way for the next-gen model, so now seems like a good time to snap up the current Focus RS while it’s still hot.